This is one of my favorite resources I've ever created, and very well loved among my former students and teachers around the world who have purchased and used these materials. You can check it out on TeachersPayTeachers here! The first thing you'll find are 18 pages of simple, behavior-focused worksheets. 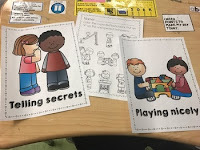 These are designed to be accessible to non-writers and writers alike, be simple for paraprofessionals or volunteers to assist with, and provide communication opportunities for further discussion about expected school behaviors. 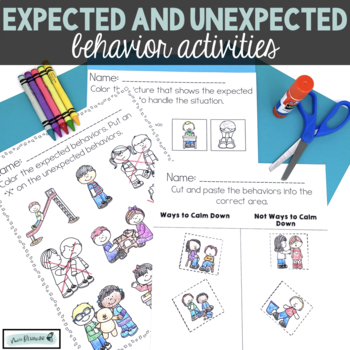 The next piece of the bundle are 18 pages of visuals and participation signs to engage in whole or small group informal assessments about expected and unexpected behaviors. 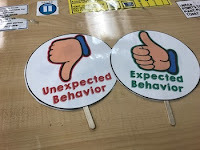 The teacher shows a full page picture of an expected or unexpected behavior, and the child holds up the thumbs up or thumbs down sign to signify what type of behavior is being depicted. Lastly - a classroom staple - the file folders! These two file folders provide multiple examples to better practice understanding of expected and unexpected behaviors. 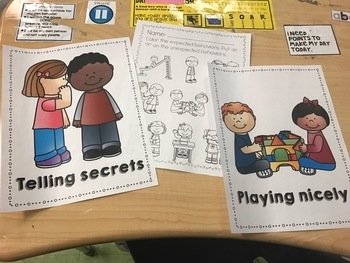 These are great for independent work stations and paraprofessional run stations after students have learned the basics of behavior. 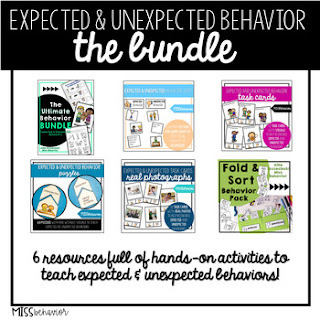 This is one of my best sellers, and part of the Expected and Unexpected Behavior Bundle. If you're looking for more tasks surrounding positive behavior identification, grab the bundle for a TON of quality, hands-on resources! The supplies I use to prepare these materials are linked below!